A famous author once said, "If a lady has never worn ao dai, she is for sure not a Vietnamese woman." Indeed, ao dai (which can be loosely translated as long silk dress) is the essence of the Vietnamese people and culture. The traditional dress is described as tight-fitting silk tunic worn over pantaloons. The modern ao dai is heavily influenced by French fashion, though the core design is derived from traditional Vietnamese clothing. The most popular ao dai's color is white. As ao dai is mostly worn by young women, the white ao dai symbolizes youthful innocence and the wearer's coming of age; older women wear ao dai as well but only for special occasions. 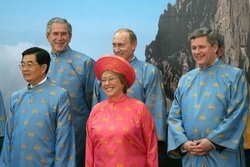 The male version of ao dai is called "ao gam" or brocade tunic. 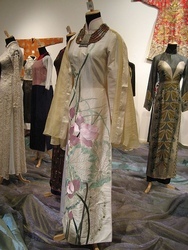 Ao dai first gained notoriety in the 1920s; it has since captured the title of Vietnam’s national costume. One of Vietnam’s greatest spectacles is the marvelous scene of hundreds of young ladies, in their ao dai dresses, leaving the gate of their school on foot or on their bicycles. It is quite a magnificent sight.